Our website has moved. Please click this link. The School of Music offers undergraduate and graduate degrees in music education, with classes taught by highly skilled faculty with terminal degrees. The music education faculty are committed to teaching and research, and they consistently contribute to the national field of music education. Bringing music into school-aged people’s lives is an exciting and rewarding profession. The thorough music training offered by the School of Music, the mastery of skills required in music education courses, and the chance to participate in the finest ensembles in the region are opportunities which set the UA music education programs apart from all others. 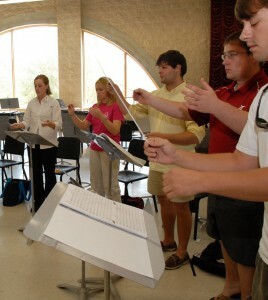 Graduates of the UA music education program are leaders in the profession throughout their careers. Our high quality music education programs have set the standard in Alabama for decades, and our faculty welcome the chance to discuss what our programs have to offer with all prospective students and their families. Complete information about programs and applications can be found at www.musiceducation.ua.edu.